This case study is originally a Oasys competition entry. 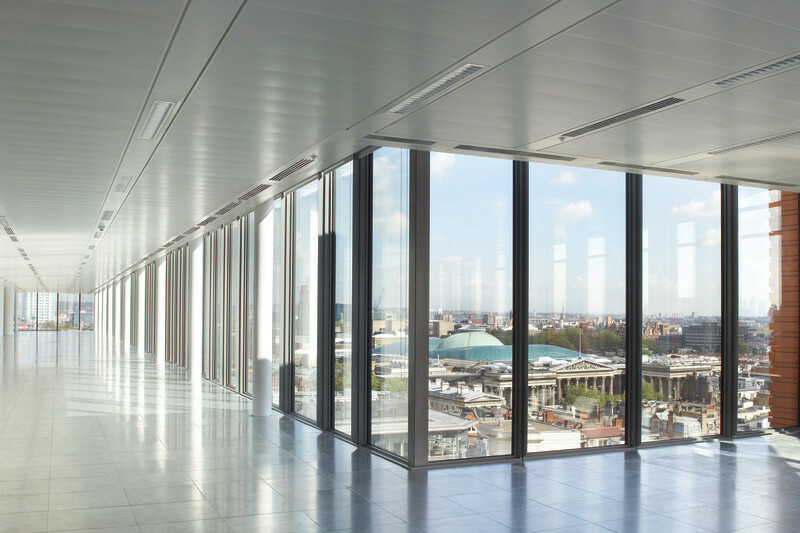 This extended abstract gives a brief overview of the evacuation analysis for a new office building build development in London, UK. The proposed design comprises of a large footprint building (160m x 100m) spread across 3 floors which is primarily intended to be used as an office and studio for television. During peak times the building is intended to have a maximum occupancy of 3,700 people. Increase visual ascetics of the space. To achieve these goals an innovative architectural open plan design was proposed which included a large atrium in the centre of the structure connecting all levels with almost no internal walls or enclosed stairs. All levels are connected via a series of stairs and ramps which link to a central mezzanine level within the atrium. The proposed design creates a number of fire engineering challenges where variations from standard prescriptive fire safety guidance and precedent are required which results in extended travel distances to places of safety and increased potential for fire/smoke spread. As such an evacuation analysis was required to demonstrate that the building occupants could be safely evacuated before a probable fire caused considerable untenable conditions. The MassMotion modelling software was chosen to conduct the evacuation analysis as it provided a suite of functions which allowed the building to be modelled and the above analysis to be conducted through in-depth interrogation of simulation results. It also provides visually realistic simulation output which assists with interpreting results and communicating key findings to approving authorities. 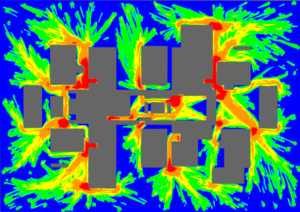 In addition to the evacuation modelling, a series of computer simulations were conducted to assess how smoke would flow through the building and potential impact on the viability of egress routes and or prevent occupants from being able to safely evacuate. Management procedures often form a key component of an evacuation strategy as occupants may not be aware of all evacuation routes. Using the default settings and parameters within MassMotion, occupants above ground typically elected to use one of four main stair cores to evacuate. This meant a series of stairs connecting to a central mezzanine area were underutilised and extended the total evacuation time of the building. Using the ‘evacuate zone’ task allowed the representation of management procedures (i.e. fire wardens and staff training) to direct certain occupants to use alternate stairs and decease the total evacuation time. When an evacuation alarm activates during a fire, often occupants delay evacuating due to a variety of reasons e.g. thinking the alarm is a drill, putting on coats before leaving, seeking information from others etc. To assess the impact of this behaviour, the ‘delay’ tasks was utilised where occupants were assigned a pre-evacuation time from a log normal distribution (see graph below) which was taken from real world pre-evacuation data of an actual office evacuation. Pre-evacuation times ranged from 0-6 minutes with most occupants starting to evacuate within approximately 1 minute. As part of the evacuation analysis, the impact of a fire/smoke blocking various egress routes (e.g. stairs/ramps and exits) was assessed in order to determine the sensitivity of the building design and evacuation strategy to a fire in different locations. 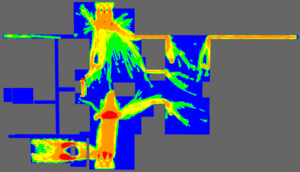 Coupled with the fire and smoke modelling (CFD) modelling results ascertaining the extent of smoke spread in a worst case fire scenario, the impact of a hypothetical fire was implicitly represented in different locations within MassMotion. Associated egress routes were subsequently deemed to be not available during each scenario. CFD modelling is typically computationally expensive in comparison to evacuation modelling. 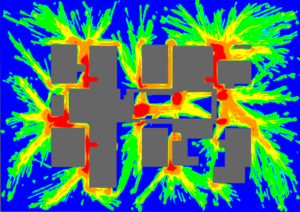 As such the use of MassMotion to implicitly represent the effects of a fire upon egress routes reduced the need to run individual CFD models for each evacuation scenario. This saved time required to conduct the analysis. For all scenarios MassMotion provided a stochastic mechanism to represent a variety of human factors during an evacuation including the assignment of initial starting locations, preferred walker speeds, and pre-evacuation times. As a consequent, running a simulation multiple times will produce slightly different results as occupant attributes vary between simulations runs. In addition, different evacuation dynamics may also emerge between each simulation run. To ensure a sufficient range of these human factors are considered within the results based on the underlying distributions, each scenario was run ten times. As an indicator of variance between repeat runs the total evacuation time was measured. 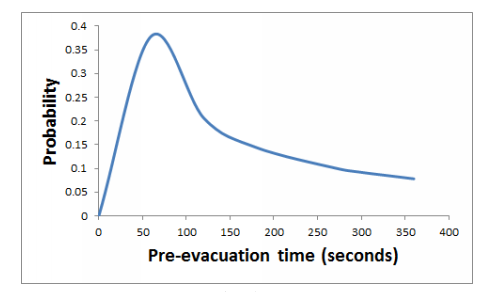 The maximum proportional difference between the total evacuation times for each repeat run was then recorded for all scenarios. The maximum proportional difference between repeat runs was less than 11% for all scenarios. This suggests that either the range of human factors represented by the stochastic mechanisms are fully represented within ten simulation runs or the variation in these factors has little impact upon the results. In both cases ten simulations was considered a suitable number of repeat runs. In the event of all exits being available and the assumption of good management procedures directing occupants during an incident, the building can be evacuated in approximately 8 minutes . In the event of a number of stairs/exits being discounted due to fire/smoke within close proximity in the most onerous case, the assumption of good management procedures directing occupants during an incident, and occupants being assigned a pre-evacuation time, the building can be evacuated in approximately 11 minutes . This is 43% longer than when all stairs/exits are available and occupants respond immediately. With the exception of stragglers (a very limited number of people who take an unrealistically long time to start their evacuation), pre-evacuation times did not have a significant impact on the total evacuation time as the time required to evacuate the building is governed by the travel and queuing at the stairs. A number of areas were recorded where prolonged high levels of congestion occurred, particularly around entrances to certain stairs in various locations and the main front ticket barriers (See areas of red in diagram below). A number of architectural changes to the layout and management procedures have been proposed to reduce congestion and increase evacuation efficiency. Informing management procedures: identifying how management procedures can improve evacuation efficiency.